Then here is something else. In June of last year, I received the following (BMUFOR note: original German letter here) from America, which you can look at here. Then, on the whole, I also gave an answer on 6/30/1997. 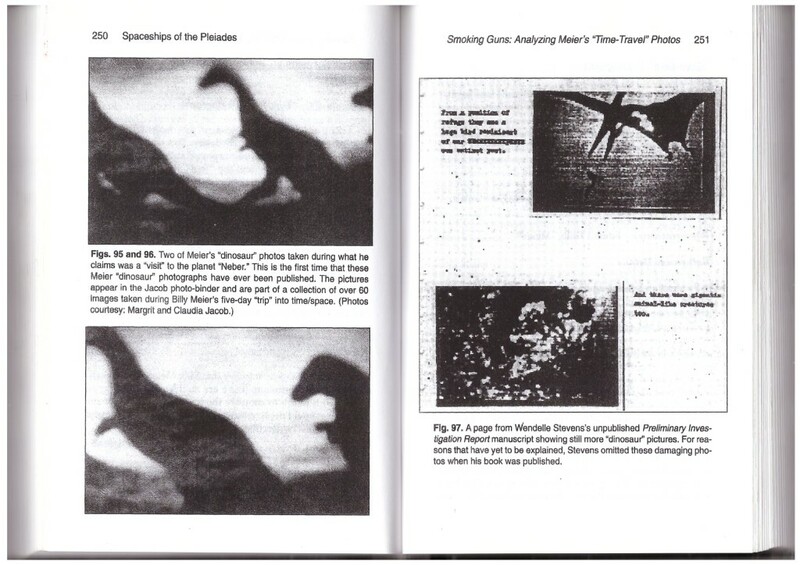 I was fascinated by Billy Meier’s ‘Dinosaur photograph’ [FT91:57]. Actually, it’s a pteranodon (“wings, no teeth”), a sort of pterosaur. The image did look very familiar; it bears a spooky similarity to a famous painting by the acclaimed Czech palaeo-artist Zdenek Burian and has appeared in many books since the early 1960s. I too have managed to photograph a pterosaur, but did take the trouble to make a model rather than rely on a piece of artwork. Does this mean that Mr. Meier didn’t travel to the Mesozoic after all? I think we should be told. The enclosed illustration with text was sent to us by Norman Decindis, who lives in Boca Raton, Florida and who has already discovered several things in some magazines or on the Internet and is always helpful to you. But this time, even he thinks that this accusation makes him sad, even though he still believes in your genuine contacts. But it is “this sort of thing that turns people against Billy.” As far as I know, he has also sent you these color images, but maybe not this letter to the editor. For my part, I can no longer recall exactly how many pictures I made on my “Great Journey,” but there were several hundred. Today, all of these pictures are no longer available, also no slides and no negatives or films, because all the material was taken away from me and destroyed by Quetzal. The reason for this was that he was furious because countless of these pictures and slides as well as films were falsified in order to discriminate against me. The counterfeits were distributed in many places and even exchanged with my own material, whereby the genuine shots were stolen from me, which were so numerous that replacements of the slides were no longer noticeable to me, especially since I didn’t look at them constantly. Now, at that time, Semjase told me that some machinations like this took place and that, therefore, I should handle the material more carefully, which Quetzal also suggested to me, who even forbade me from continuing to use the pictures and slides. Then, one day, he told me that a large part of my photographs were still being maliciously tampered with and had been distributed and that also group members had come into possession of falsified photos and slides because I had given them such, without knowing that these were already fakes, etc. Consequently, Guido has also received such pictures and slides from me. Well, one day, Quetzal took all the material and destroyed it, through which greater harm should probably be avoided. Nevertheless, many falsified pictures and slides are still in circulation all over the world, and indeed, so numerously, as Quetzal said, that not all of these can be investigated, so everything is simply left as is (which is also true of photos and slides of the ships). Thus, in accordance with these facts, it is very well possible that it concerns a forgery of the right image, which is foisted on me or had already been maliciously foisted on me by a willful exchange. However, the breast portion of the flying dinosaur as well as the underside of the beak appear suspicious to me because these are not consistent with the picture of the artist Zdenek Burian, whereas the wing piece at the bottom of the image appears to be identical. Anyhow, as to whether this is fake or not, on the one hand, there are at least two striking differences; on the other hand, I cannot judge whether the image committed to me is genuine or not because it has already been too long that I can still remember all pictures, slides, and films, especially because many memories have been erased from my memory and haven’t been reclaimed after my serious health collapse in November of 1982, when I suffered a severe head trauma and lost large parts of my memory capacity. Now, of course, I won’t simply let the matter rely on itself but will ask Ptaah at the next opportunity, who can surely give me information. But when he will come, I do not know, but I will fax you his answer promptly, as soon as he has appeared and has given me a suitable explanation. Unfortunately, up to now, the events surrounding the fakes and concerning the photos, slides, and films destroyed by Quetzal haven’t been mentioned much in the Contact Reports because everything took place outside of the public contact conversations, but I’m sure that Ptaah will answer the question, at least in the framework that he knows. Until then, all the love and all the best. 84. We and other people in your immediate and wider vicinity, in accordance with our own and also your clarifications, are well aware that many of your photos relating to our aircraft and others that are connected to us were maliciously falsified or were even imitated from the ground up and became falsified in this manner. 85. In this regard, not only was that photographer extremely busy, whom you know by the name of Schmid of the Rhine Valley, but also several other people at home and abroad, who were jealous and who still are to this very day. 86. Among the forgeries and falsifications weren’t just the photos that showed our aircraft but also those images that you made on your Great Journey. 87. This is especially true for the dinosaur images as well as for the Apollo-Soyuz images, but also various other images belong with these. 88. Overall, as we’ve determined through detailed investigations, you had made 1,476 photos with your Olympus ECR 35 mm camera, as well as 34 films with your movie camera that you could use with just one hand. 89. Of the photos, several hundred were stolen from you, and moreover, at least which we could clarify, 230 of these were falsified. 90. There was also falsifying through the manipulation of several films, and to be sure, in the way that our aircraft were suddenly represented as though these had been suspended from thin strings or wires, etc., and so, the impression was made that these were models. 91. Concerning the dinosaur images that were addressed in the letter to you, it seems to me, as you mentioned, that something isn’t right, for as I see, the two images aren’t exactly alike. 92. It may be that it is a forgery that has been foisted upon you, like also so many other forgeries, as I already explained. 93. But now, we can no longer investigate what is actually the case, unfortunately, because as you know, Quetzal took all the originals and copies of slides and negatives, etc. from your workroom and eliminated them, so today, we can no longer investigate the concerns in this respect. Quetzal acted, perhaps, somewhat hastily? 94. I don’t think that was the case, for as it proved itself, it really was necessary. 95. We also should have done the same with various images of our aircraft. 96. A lot of harm would have been avoided through this, especially if we had secured the deceitful forgeries and falsifications produced by the photo and film counterfeiters. 97. But in this connection, we had to comply with our directives, as this was also recommended to us by the High Council. 98. We could and were allowed to intervene directly only in those concerns that stood in a direct relationship with us – and this was just your personal film and photo material. … then still something else: As you do know, for quite some time, there has been a lot of activity around the world again in terms of slander against me. Secret Services, alleged UFO researchers, as well as know-it-alls and maliciously minded adversaries of all kinds desperately try to defame me and my work by all sorts of unfair means. Some so-called UFO researchers and UFO know-it-alls of self-styled graces have, therefore, been at work again for some time, in order to foist space pictures, dinosaur pictures, and UFO pictures on me with the lie that these were made by me on my Great Journey in 1975, that is, that I should have faked these by the photographing or copying of existing pictures of some draftsmen or artists. In this connection, Hans-George has written the following article, which I want to publish in a Special Bulletin – if you want to read it? (…) With timpani and trumpets and roaring storms, they have been greedily pouncing for years on an alleged Meier photo‚ on which a flying dinosaur is feeding its young. In their blindness and their investigative delusion, BEAM’s opponents stubbornly and firmly maintain that the aforementioned photo was personally taken by “Billy” on the space journey in July of 1975, without concerning themselves, however, with the true history of its origin and the actual contexts of the picture. Their assertions relating to this are nothing more than gullibly parroted, cheap clichés of pseudo ufologists, such as Kal Korff. In reality, the aforementioned photo was not taken by “Billy” Meier on NEBER, even if the opposite is stubbornly maintained. A journey with Semjase into the galaxy BEBERAS to the world NEBER in the KRAS system did, in fact, take place during the 31st Contact on the 17th of July, 1975. The world inhabited by dinosaurs, NEBER, is 9.38 billion light years away from the Earth. These facts can be read in the bound edition of The Pleiadian/Plejaren Contact Reports, Block 1 (2002), on page 432, sentence# 575 and the following. During the journey, some photographs of various primeval animals and humans as well as pyramids were actually made by BEAM, some of which are shown in the edition of the book mentioned. 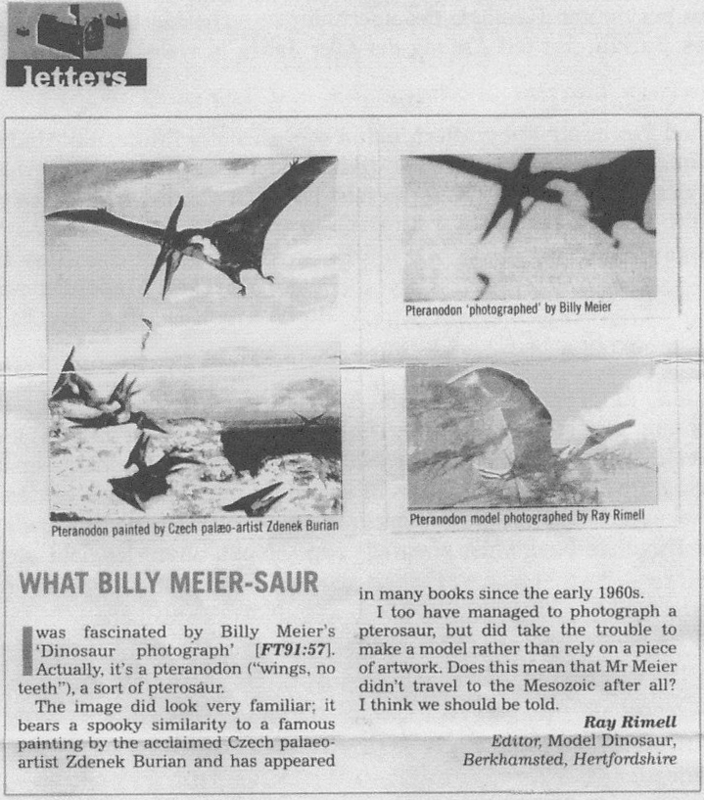 However, these dinosaur photos from the 17th of July, 1975 never found the official sales channel into the public by FIGU or “Billy” Meier, and for good reason. After the return from his journey to the planet NEBER, the pictures were, like also many of the first photos, developed and worked on by the now deceased photographer Schmid. He was the photographer who was described by Hans George Lanzendorfer in the article titled “ASKET and NERA, American Lookalikes on Photos, which were Later Falsified by a Foreign Hand, of the True Contact Person to Extraterrestrial Intelligences, ‘Billy’ Eduard Albert Meier” and published in FIGU Bulletin No. 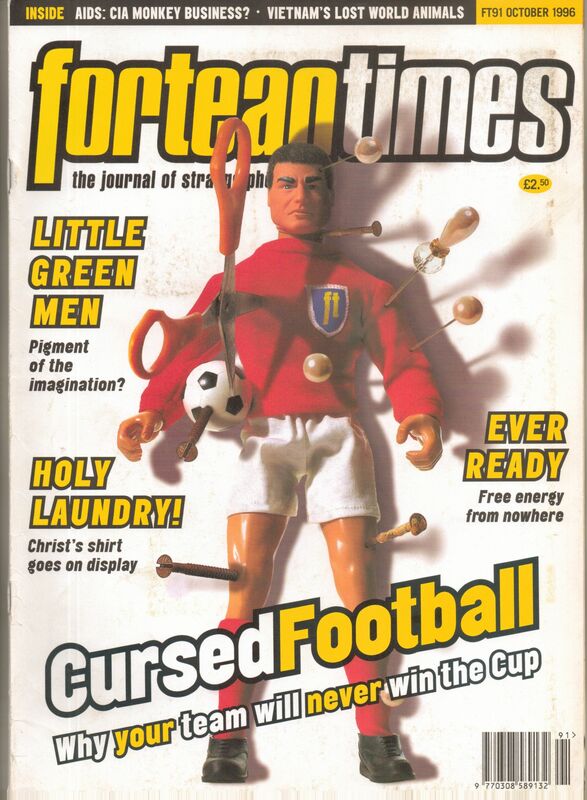 16 of June, 1998. After the freshly developed dinosaur pictures were in the hands of “Billy,” these were seen and inspected by Quetzal. During this, dozens of pictures were noted by him, which quite clearly could not have come from the world NEBER and, therefore, had not been taken by “Billy,” about which Quetzal got very angry. It was obvious that false and manipulated pictures had been foisted on BEAM once more by a foreign hand. Many of the pictures had obviously been photographed from a book and were to have been smuggled into BEAM’s photo collection as so-called cuckoo’s eggs. This especially concerned that photograph, on which a pterosaur, with an ejecting fish and a white spot on its belly, was portrayed. With the help of this counterfeit, “Billy” should have one day been made a deceiver and contact swindler. Because of the manipulations, the photos were immediately recovered and destroyed by Quetzal in the middle of the 1970s, and indeed, still before they could be brought into circulation by FIGU or by “Billy.” Still today, the aforementioned dinosaur photo, along with various others, is passed around on the Internet as “Billy” Meier’s counterfeit, even though “Billy” has always vehemently kept himself from an attribution. (…) In the course of the joint correction work on the Contact Reports by Ptaah, Florena, Enjana, “Billy” and Bernadette Brand, the time for clarifying had also come. 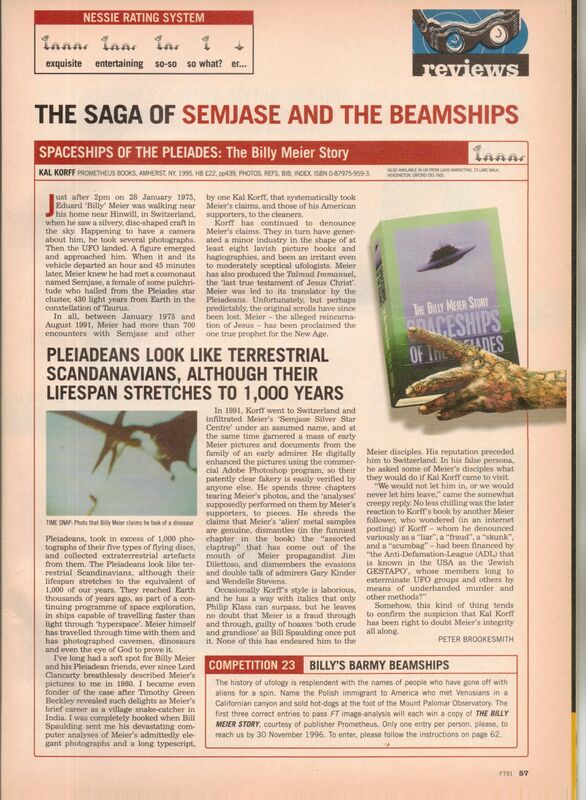 In the year 2001, Guido was asked by “Billy” to make some of the photos available for publication in the corrected Pleiadian/Plejaren Contact Report Block. Therefore, since the year 2001, several genuine dinosaur pictures and dinosaur slides from the possession of Guido Moosbrugger are to be found with “Billy” again, but these remain strictly under wraps. For the publication in the Contact Report Block, it was strictly ensured, with the help of Ptaah, that it only concerned “Billy’s” genuine pictures or his pictures that were only slightly falsified by Schmid, whereby the aforesaid falsification, for a logical reason, found no use. 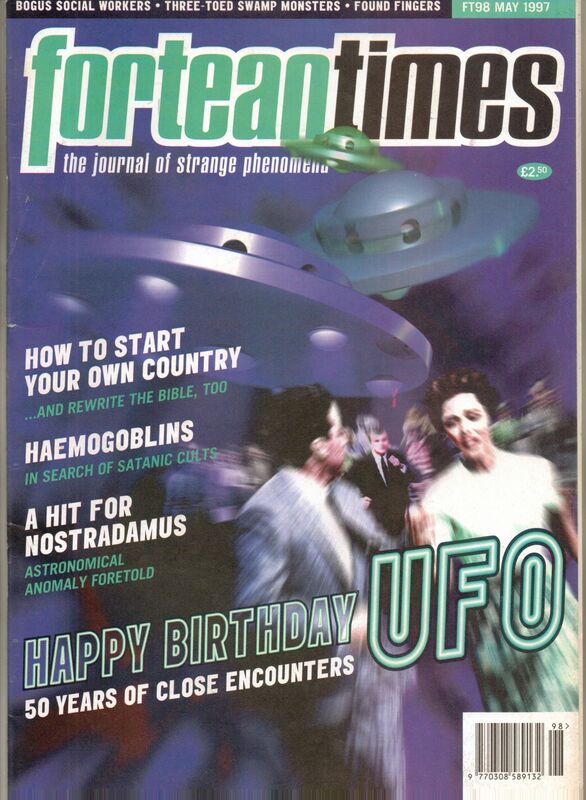 For this reason, the photo of the pterosaur that was falsified by a foreign hand is not shown in the new, hardback Pleiadian/Plejaren Contact Reports Block No. 1. The picture mentioned was, in fact, initially a part of the collection and in the possession of “Billy” up to its destruction. But after the handover by the photographer Schmid, it was, as already explained, recognized by Quetzal as a falsification, along with around 1,462 others..
Several times, the “Men in Black” also tried to achieve their goal at the Semjase Silver Star Center with attacks on the vehicles of the members or by intimidations and kidnapping attempts of the children, etc. In this form, also the photographer Schmid, whom “Billy” had incorporated with the permission of the Pleiadians/Plejaren, was forced by the “Men in Black” to produce falsifications of the photographs. 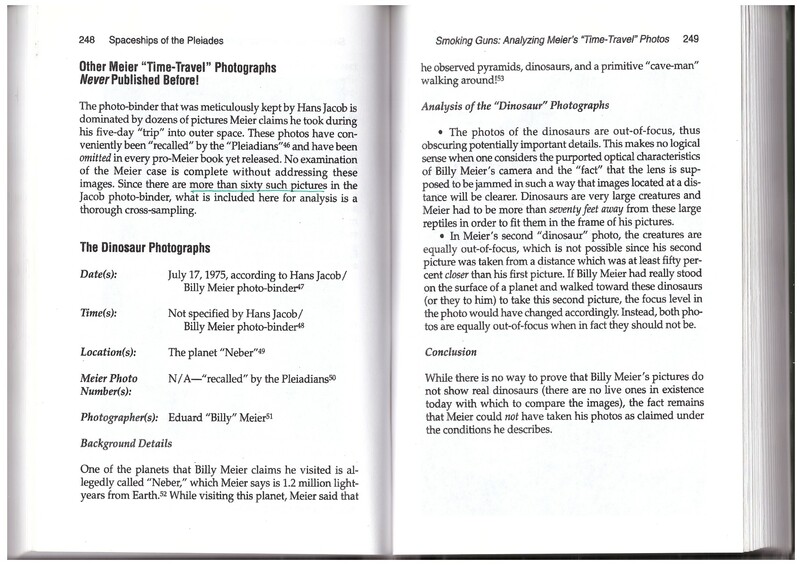 On several occasions, pictures that Schmid had received from “Billy” were falsified from the ground up or replaced by forgeries, as this also happened with the Asket and Nera photos and with the aforementioned dinosaur photo. In this way, Eduard A. Meier, already at the beginning of his contacts with the Pleiadians/Plejaren, received false slides, negatives or manipulated photos back from Schmid unnoticed. This photographer has passed away in the meantime and, therefore, is no longer able to provide any information at all on these machinations. The fact is that at no time were any fake dinosaur photos knowingly published by “Billy” or FIGU as genuine photos of Billy. Even today, such pictures are not offered for sale among the officially available photos in the visitors’ albums. The so-called dinosaur photos also aren’t included in the Photo Index of FIGU. Quite obviously, in the middle of the 1970s, it was part of the plan of a sleazy counterfeiter’s organization, the “Men in Black” and treacherous FIGU members (who ultimately withdrew from FIGU on their own accord, as a result of their useless destruction efforts) to assign the aforementioned picture, along with various other falsifications, to the collection of “Billy” Meier’s photos. It was their goal to be able to confront him one day with the fact of a forgery, as they would have almost managed to do this in the case of the Asket and Nera photos. But in wise foresight, the undertaking with the falsified dinosaur photos was thwarted by Quetzal as far as possible, whereby some of the original photos of dinosaurs were, unfortunately, also recovered and destroyed by the Plejaren. Through this, the pictures were, indeed, lost, but further abuse was prevented. 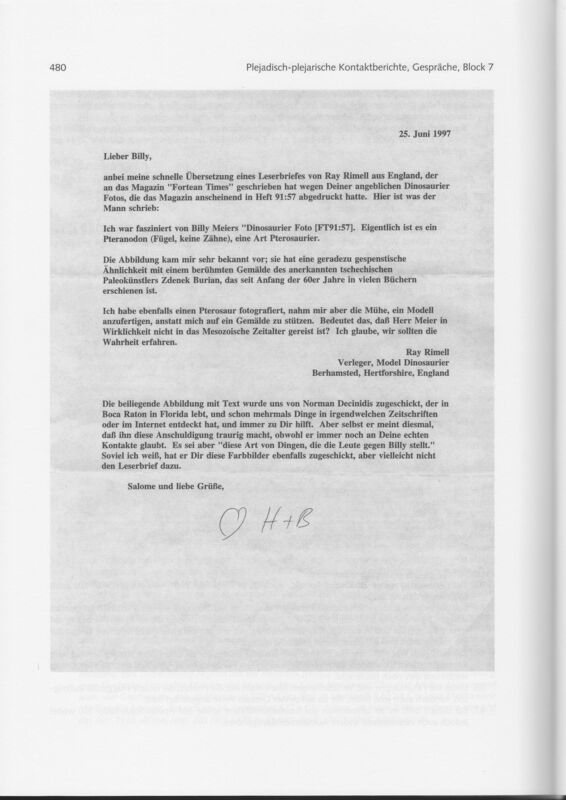 (…) Already years ago, Heidi Peters, a German-born passive member who was active in the USA and who also worked as a translator for Billy and FIGU, should have published an explanatory article on the subject of the dinosaur photos because she was very well familiar with the effects of the machinations. Unfortunately, she could no longer fulfill this task after a severe illness. Hans-Werner Peiniger also blows into the same horn on the Internet at the address: http://gep.alien.de/gepweb/?page_id=89, by representing the unqualified nonsense of Kal Korff. His opinion and explanation are also wrong, based on the existing and truthful facts. 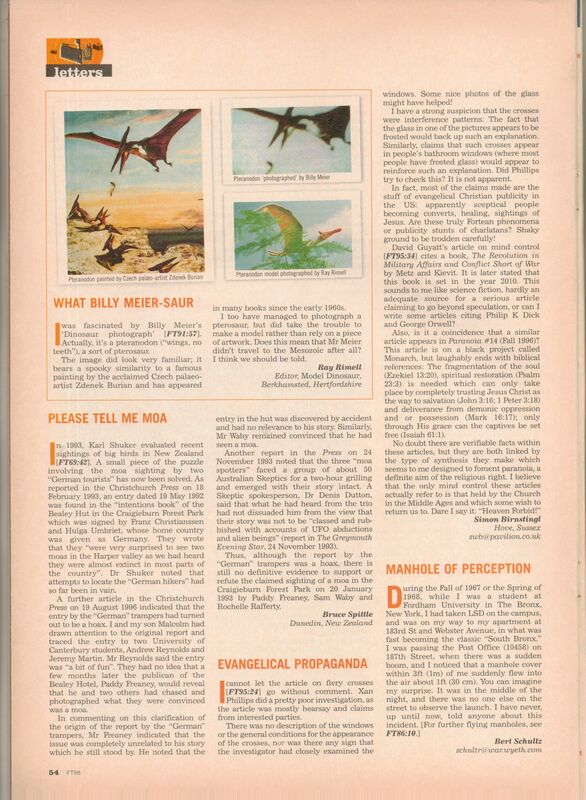 In 2008, IIG group has posted their analysis of Meier’s supposed Pterosaur picture on their now inactive webpage. However their analysis can now be read on former IIG member Dereck Barthlomaus’s dinosaur photo decontruction web page. Even before IIG, SpaceTimeNews have been able to locate a possible original source which contains the illustration that is identical to Meier’s supposed Pterosaur photo and published their findings on Nov 18, 2004. Their work was also cited on the forgetimori website under the article – ‘The Billy Meier hoax photographs’, published on Aug 30, 2007. Refer to More References – Outer space photos.